In just a fraction of a second, a car accident occurs, and in just a fraction of a second, your world is turned upside down by unforeseen injury. If this sounds like something you have encountered, you have come to the right place. Spine and Whiplash Center is home to chiropractors that are trained specifically in your recovery. Dr. Lewis and Dr. Coulombe are on your side, ready to help you fight for full recovery. Contrary to popular belief, muscle is very rarely involved in crash-induced injuries. Stretched and torn, the ligaments that support and stabilize the spine are what tend to take the greatest hit during auto accidents. Our ultimate goal when treating automobile crash injuries is the reduction of pain, promoting soft tissue healing and restoring the function of injured structures. When you come in to see us, we will evaluate your injury, order necessary X-rays and MRIs, and prepare a customized care plan in hopes of substantial rehabilitation. Following the AMA guidelines for evaluation of spinal ligament injuries, we utilize a special Spinal Kinetics service to help us thoroughly analyze your X-rays and pinpoint your exact problem areas. At the practice, we have worked with many victims of car crashes, some with small injuries and some with significant ailments. 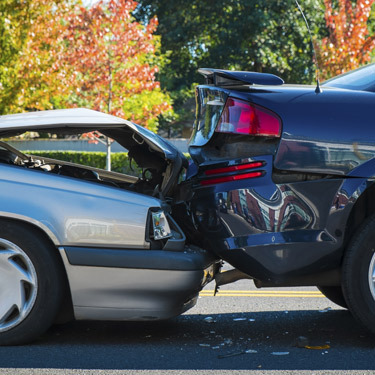 Our knowledge of auto injuries, as well as our healthy working relationships with major insurance companies, allow us to provide unmatched post-accident care. We are glad to work with your insurance company to minimize your personal financial responsibility. As injuries vary from patient to patient, it is hard to know exactly how long you will be under our care. Mild injuries may take eight to 12 weeks to reach full recovery, while moderate to severe injuries may take six months to several years. No matter the depth of your injury, we are here to help you through the entire process. Auto accident injuries are serious and can pose significant lifelong health difficulties. The Spine and Whiplash Center doctors are prepared to learn more about your personal injury and work with you to come up with a care plan that fits your needs.